After seeing Spartucus Chetwynd’s performance ‘The Triumph of Death and King Midas’ one can’t stop wondering whether the continuously grinning performers had been carefully instructed or not. 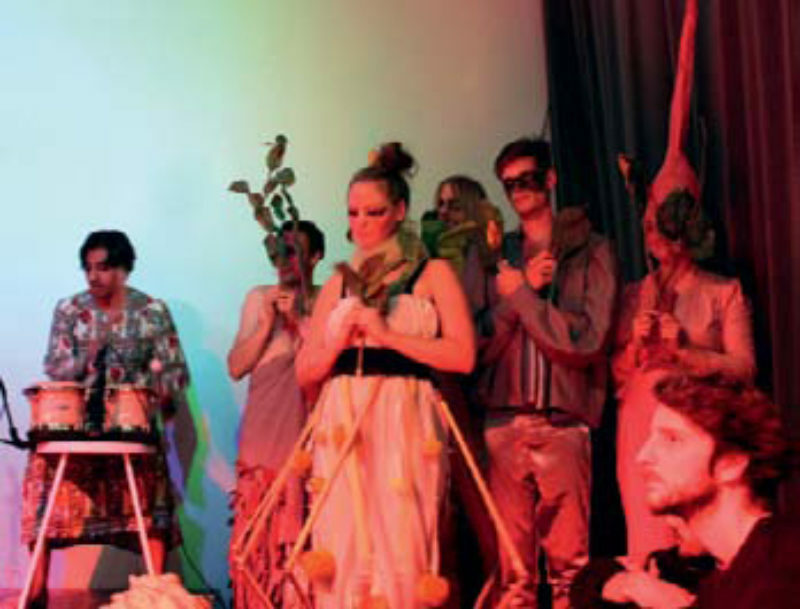 Held during the opening of Morality in Witte de With, Rotterdam, the performance could be regarded as a silly combination of teenage goth and amateur play. The actors, and this actually turned out to be the case, seem like a group of friends just having a good time. But apart from this (un)intentional frenzy, Chetwynd’s performances made perfect sense in relation to the leitmotiv of Morality— a multi-faceted project with group exhibitions, public events programme, a web platform and a book. It is a provocative gesture to take morality as a theme for such an extended project in the context of today’s multi-faceted society—a statement by the curators. The ‘good’ and the ‘bad’ can no longer be defined unambiguously, which makes every effort to grasp the concept of morality a thorny adventure to start with. This is probably why the organisers describe the project as an exertion to ‘explore critical points of fragmentation in everyday life’ and are ‘focusing on the less tangible forces and attitudes that shape common thinking and behaviour’. Still, there appears to be a didactic motivation in this, that is more serious, than provocative. This educational principle is also apparent in Chetwynd’s performances, based as they are on the mediaeval morality play, which offered to educate people through entertainment. Two of Chaucer’s Canterbury Tales are transformed by Chetwynd into contemporary versions. After an opening dance by the joyful and elaborately costumed actors, The Triumph of Death warns of the dangers of money. Accompanied by mediaeval folk music sounds played on electronic instruments, the story unfolds via several tableaux and mime acts. Following the principle of the cautionary tale, it allegorically depicts a group of lads who, on their way to Death, fall upon a pot of gold and become overwhelmed with excitement and greed. Intending to divide the money among them, two of the lads go off to buy food and drink, while the other two guard the gold. The newly founded pairings each decide to kill the other in order to increase their riches. So, when the two return with food and beer, they are stabbed to death by their erstwhile companions. Then, as the surviving men drink to victory, they too perish, their beer having been poisoned on the trip back by their victims. The tale of ‘King Midas’, less allegorical and thus less fitting to be performed in mime and tableaux, ends with ‘death by greed’. The eponymous king, who asks Dionysus to make his touch turn everything into gold, shockingly dies of hunger and thirst, unable to eat or drink because of his gift. It isn’t likely that Chetwynd’s ‘morality plays’ intends to get across the same ‘moral’ message as the original stories to her audience. Rather, she is ridiculing these moral instructions with her amateurish scheme. Apart from the musicians placed on a low platform, there is no stage setting. The performances are held in a small auditorium amongst the crowded audience. The costumes of the performers are loosely stitched together assemblages of fabrics, some plastic, and other found materials only slightly referring to the mediaeval clothing known through paintings by Hieronymus Bosch. Chetwynd herself is dressed in a carnivalesque jumpsuit with panther print. The black make-up that is placed so brutally indifferently on the faces of the actors makes their grins even more bizarre. In previous performances, a taste for the socially deficient ‘other’ becomes visible in Chetwynd’s work. Adapting cult-characters like the Incredible Hulk, Star Wars slave trader Jabba the Hutt or Michael Jackson in his famous zombie ‘Thriller’ role, reveals her love for the anti-hero. Indeed her eclectic, over-the-top, and at times vulgar, folk celebrations evoke a certain sympathy for those ‘misbehaving’. However, in spite of all the excesses, a serious undertone can also be perceived in Chetwynd’s work. A small booklet, handed out at performances, contains a reference to Mikhail Bakhtin’s book Rabelais and His World, in which the notions of the carnivalesque and the grotesque are associated with collectivity. The rite of the carnival enables people to get out of themselves and to be equal in caste, property, profession, and age. Through costume and mask, they exchange their physical presence for a ‘renewed’ presence. It is exactly this atmosphere that Chetwynd attempts to provoke with her plays. Although the audience does not actually take part in the event, it is encouraged to let go of set values and preconceived ideas, and to leave the scene with a relieved heart.